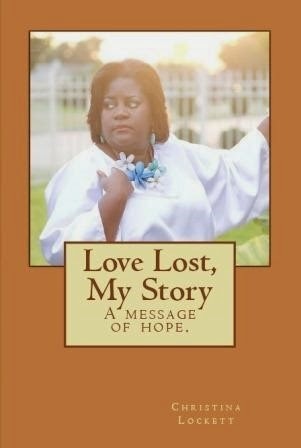 Today we are interviewing Christina Lockett, author of the inspirational book Love Lost, My Story: A Message of Hope. I am the youngest and only girl of four children, born to two loving parents Conrell and Beatrice Lockett. I am a native Houstonian and a licensed cosmetologist since 1996. I am single mother of two teenage sons ages 15 and 13 years old. I am a licensed and ordained minister, choir director, and Sunday School Teacher of Holy Trinity Church. I am recent college graduate of Texas Southern University with a Bachelors of Science in Curriculum and Instruction Interdisciplinary Studies. I am a certified school teacher currently teaching fifth grade Science. I wrote this book to inspire people not to give up. It is easy to give up and loose hope when you have unexpected turns in your life. Sometimes things just happen but we must keep moving forward. Is it a topic that a lot of people can easily relate to? Yes, the book is based on my experiences after two failed marriages. I think men and women can relate to disappointments and infidelity in relationships but I hope my readers will understand that my message of hope is beyond intimate relationships. As the author, do you have a unique background different from most other authors? My background is unique because I did not plan to be an author. I decided that I wanted to share my story and let people know that they can face their challenges in life with a positive mind and change it. My personal motto is a positive mind plus positive words will equal a positive outcome. I believe women ages 25 and up would appreciate this book the most. Did you learn anything about yourself while writing this book? While writing this book I learned that I am able to forgive with a pure heart. You’re currently a teacher. What inspired you to get into teaching? I was inspired to teach after I started working as a substitute teacher to supplement my income. I wanted to impact children that I think are sometimes left behind by the educational system. I know people who will read my book will be inspired to move forward past their challenges. My family and friends were shocked at what I shared in the book because they always saw me smiling, being positive, or encouraging others. They are extremely supportive and asking about the next book. I am not sure but I leaning toward a book of affirmations for single parents, recently divorced women, and burned out teachers. I want potential readers to know that they will be able to relate to something in the book and after reading they are sure to have a smile of hope. I go to church with hopes of having a spiritual encounter. My focus is on God and him alone. I did notice that we had a new member in our church but I truly did not pay any attention to him Again, it was not my focus. I found out that he was asking about me and wanted to know if I was single because he saw me with my son and he was not sure if I was married. I wish that the older lady from our church would have never told me because now I was nervous every time I saw him at church. You have to keep in mind that my first husband was my everything. I had not dated anybody else neither was I interested in dating. My first husband’s grandmother encouraged me and told me that I was a young woman and it was OK for me to move forward and go out on a date. It is imperative to keep people encouraged when you know they are going through a rough season. I cannot put into words how she inspired me and helped the healing process begin in my life. The first Sunday of 1999 a few people from my church decided to play matchmaker. They decided the best way for me and the new guy to talk was if we all went to Sunday dinner. It was a large group that included our pastor with his wife and family, members of our church. I had my son and nephews as with me as well. I think it did take the pressure off because after dinner we met back at the church. Those who carpooled could retrieve their vehicles and I lived about 2 minutes away. The older couple from our church and their son came over to my house as if they were chaperones. That guy came as well. Their son, the guy, and my nephews played basketball for a little while at my house, then they all came inside. All of sudden the older couple had somewhere to be and they left. Set-Up! So we talk alone. We talked and we talked and we talked, so much that we did not realize the time. It seemed like we were old friends. We exchanged phone numbers and started dating.